Carl’s Jr. Rolls Out First Grass-Fed Burger, But is It as “All” “Natural” as They Claim? Thanks in large part to health documentaries and the grassroots movement for food integrity and transparency, legions of customers, especially younger ones, have begun a mass exodus from fast food companies. Fast food giants nationwide have felt the heat, and now one major chain is responding, delivering what it calls a “revolutionary” change to the fast food industry: a new 100% grass fed burger, the first of its kind in years. While the change to Australian grass-fed, free-range beef away from American (genetically modified) corn-fed factory farmed beef is a big step forward for food integrity, the chain still has a ton of work to do in the transparency department. Because while the new beef patties are as natural as it gets in the fast food world, the chain’s definition of an “All-Natural” burger smacks of the same deception food consumers everywhere have grown to loathe almost as much as the chemical ingredients themselves. What’s in an “All-Natural” Burger, Anyway? The chain in question, Carpinteria, CA-based Carl’s Jr., is quick to point out the revolutionary nature of its new beef, something no other national fast-food chain (other than perhaps Chipotle Mexican Grill, which is more fast-casual) can claim. And they do note that the term “all-natural” refers to the patty only (in fine print on their website, that is). But even though the beef itself is a big step up in quality, the ingredients list (shown below) paints a picture of a fast food burger that looks, well, the same as any other fast-food burger; one loaded with unnatural and chemical ingredients. 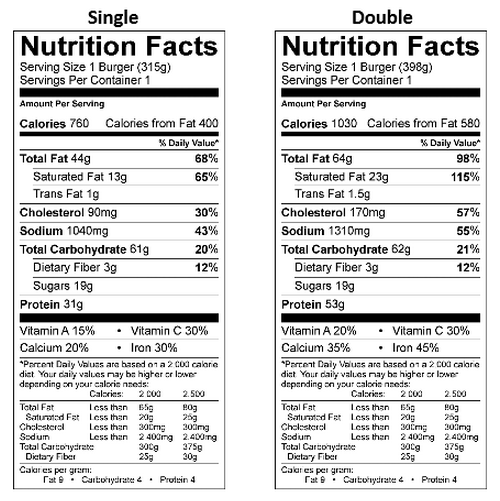 The “All Natural” burger’s Nutrition facts (note the high amounts of sugar and sodium). 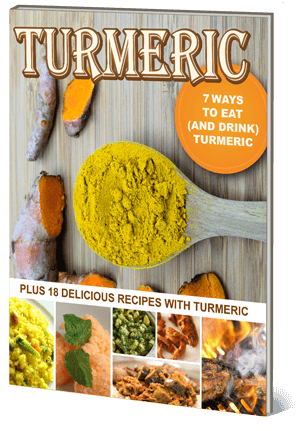 These are nice to know, but the real story lies in the ingredients list (see below). A breakdown of the “All-Natural” burger’s ingredients. Carl’s Jr. notes in the fine print that only the patty is “all natural” yet advertises in a manner that alludes to the entire burger being “all natural.” Other non-highlighted ingredients are likely to be potentially tainted with GMO material such as vinegar,and animal-based ones like cheese and eggs that are not pastured. Since the food integrity and transparency movement began, several companies including Pepsi, Barbara’s Cereal, and Heinz (over vinegar and GMOs) have been sued for false “all natural” claims on their products. 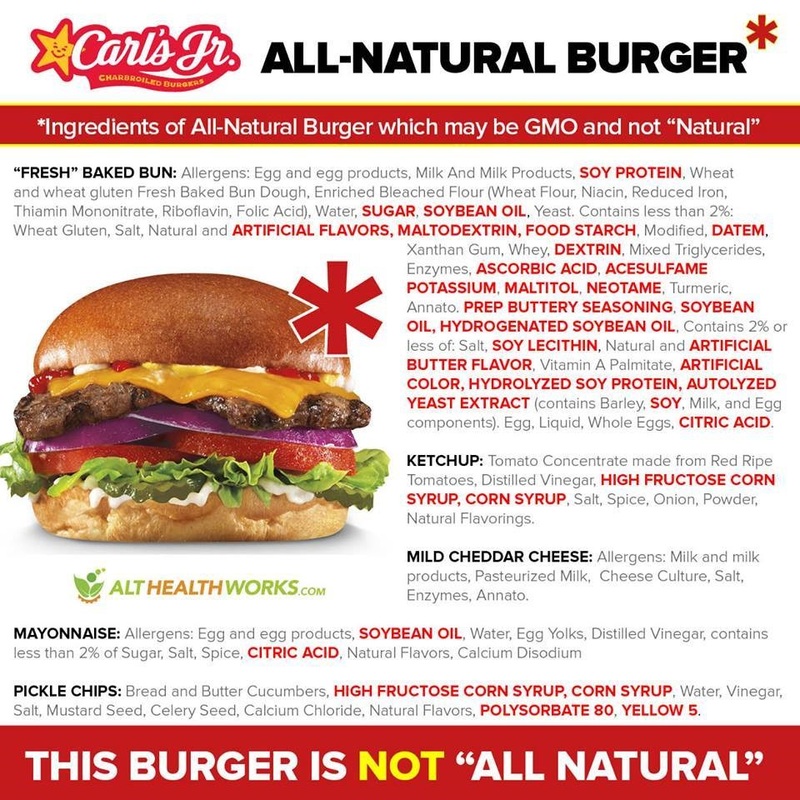 Q: Are all the ingredients that comprise the All-Natural Burger at Carl’s Jr. natural? A: The charbroiled All-Natural patty is topped with a slice of natural cheddar cheese, ketchup, mayonnaise, mustard, red onion, vine-ripened tomato slices, lettuce and bread-and-butter pickles on the brand’s signature Fresh Baked Buns (editor’s note: interesting how they claim the “burger” consists only of the patty on their website, and yet they seem to classify all of the ingredients as being a part the burger in this email). Q: Are any of the ingredients in the All Natural Burger artificial? Q: Other than the standard manner in which the burger is being sold and advertised are you allowing or encouraging any other changes to the burger? A: New All-Natural Burger features the first all-natural, no added hormones, no antibiotics, no steroids, grass-fed, free-range beef patty from a major fast food company. Is this really the first “all natural” burger in many years for a fast food joint? Ignore the misleading banner from the Carl’s Facebook page, read the fine print, and you’ll have your answer. Is the New “All-Natural” Burger Worth Your Money? Available now for the price of $4.69 or as a double burger for $6.99, the new grass-fed burger is targeted to “Milennials who are…much more concerned about what goes into their bodies than previous generations” according to the press release. But what the press release fails to mention is that the concern has arisen in large part because of the fundamental changes (GMOs, chemicals) that have been made to our food supply without our consent. The changes have been allowed to happen in large part due to corporate doublespeak and a consistent PR spin not unlike the one Carl’s Jr. is currently putting on its new burger creation. Whether or not you personally believe the burger is a big step forward, or simply more of the same deceptive food industry tactics (in this case ones that blur the lines of what it means to be a “burger”) is up to you. And whether or not you personally think it’s worth it to consume artificial ingredients like Neotame and artificial colors simply because they’re on top of a natural beef patty is a personal decision; one that will ultimately decide whether Carl’s Jr.’s “ambitious” new concept stands as a “revolution” or goes down as just another failed marketing ploy.